My mother believed that every New Year’s eve at the stroke of midnight everyone in our house had to have a spoon full of Lentil Soup. 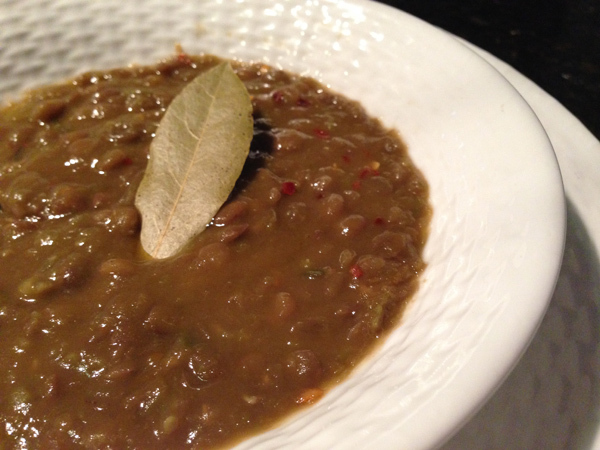 According to some weird Italian superstition, the Lentils would bring you good luck in the New Year to come. For my entire childhood and up until I left my parents home and had a place of my own, we continued that tradition. Maybe that has something to do with why I love a steaming bowl of Lentil Soup (although I stopped the whole New Year’s Eve thing long ago). In fact, it is one of the first dishes I ever made for my husband when we were dating. The old saying is true: The way to a mans heart…. Want to make this soup a bit heartier? Cook up some ditalini pasta and pour the soup over it in the bowl. Sprinkle on little parmesan cheese, and you have a delicious meal! Heat the olive oil in a large stock pot or Dutch oven over medium heat. Add the ham bone and sauté for a few minutes, until the oil becomes fragrant. Add the onion, carrots, celery and garlic and sauté until just softened. Add in the tomato paste and stir so that it starts to coat the vegetables. Pour in the water, lentils, split peas, tomato sauce and salt and give the entire pot a good stir. Raise the heat to medium high and bring to a boil. When it has come up to a boil, stir again. When the soup has cooked for two hours, remove the lid and raise the heat to bring the soup back to a rapid simmer. Let the soup cook for another 20 minutes and thicken up. The Elegant Occasion Note: Store the soup in an airtight container in the refrigerator for up to five days or freeze the soup for up to two months.